I should preface this post by saying I’m very particular about the colour pink. I have a certain type of pink I like to wear when it comes to makeup, and if the shade isn’t just quite right then I am not buying it. Unlike some of adore a good ole pink gloss or blush, I am straight up picky about the colour in question. 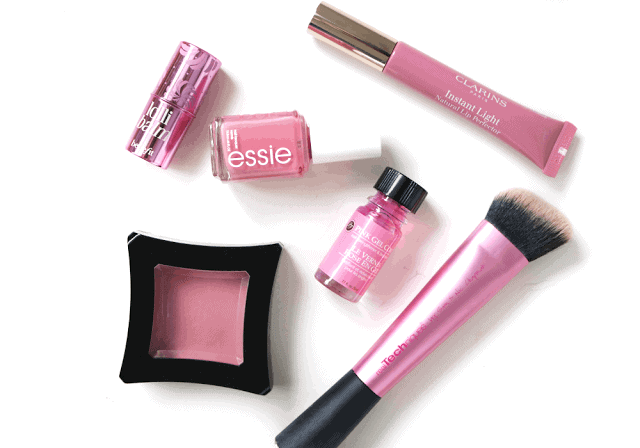 So, here are six pink products I really like! I really didn’t think I’d like this as much as I do. It’s a cooler toned mauve-pink that makes my teeth look super white, has a nice sheen to it and doesn’t give me that ‘Barbie-pink’ or ‘dead-pink’ look that some cooler shades can. On the other spectrum, this is a gorgeous warm pink that almost makes my skin look like it’s got a touch of tan to it. This is easily the most wearable pink polish I own; It never seems to clash with anything! The newest edition in the infamous Instant Light Lip Perfector range, #07 is a neutral rose that is basically your-lips-but-better, plus hydration and gloss all wrapped up into one. I suppose this is a bit of a cheat in the sense that it is a tool, but it one of my favourite brushes I own! I use this in a non conventional way: I pat and blend my undereye concealer in with it. The density of the bristles really pushes the product into the skin minus brush strokes and patchy spots in seconds flat! I’ve been struggling with getting my nails so long, only to have them all break. So I’ve been turning to this to give them some strength and the ever so slightly pink tint keeps them from looking yellow after too much polish abuse. A long time favourite! This yellow base in this pink makes my skin look radiant and healthy, minus shimmer. Unlike cool-toned pink blushes, it never gives me that ‘Aunt Sally who always wears too much rouge’ look. Is there a colour you ar very particular about how you wear? What are your favourite pinks?